Way back when I saw my first purse frame, I really did not completely understand the mechanics of the frames. 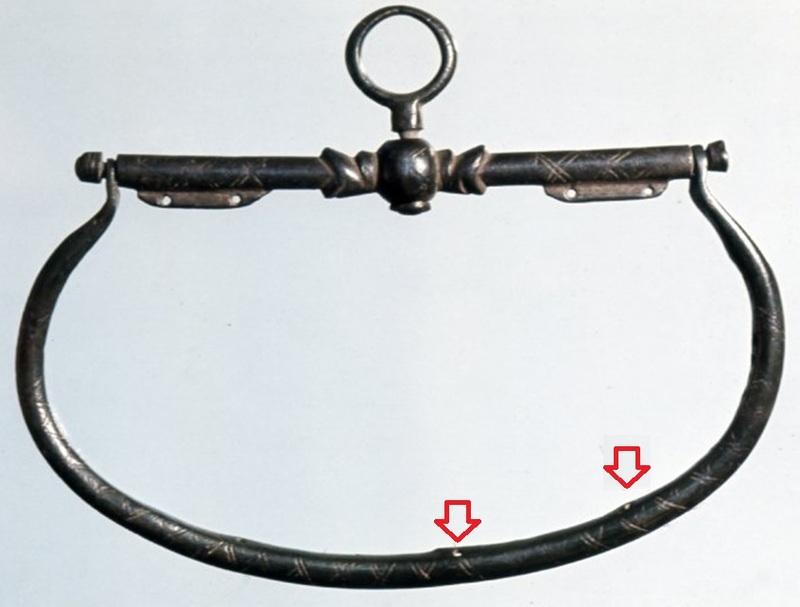 What was the most common form of purse frame? What sort of fancy frames were available? Was there a bargain basement purse frame available? How were they worn? So let’s start at the beginning. When I started writing this blog I remembered that I had seen my first purse frame ever at the Victoria and Albert Museum in London, England. So I went looking for it in their digital collection. This is the purse frame that I saw at the V&A. I actually found it online in their collection! And now I totally see why I was confused. This is not a “typical” purse frame. Add to that the fact that the frame was displayed flat on a board, without any clarifying pictures, or or an explanation of how it would have been used. If you go to the link you can see the Niello decoration on the one purse frame loop, and the top. I admit I spent a couple of hours “off in the bushes” doing a little Latin research to see if I could figure out exactly what it says on the purse frame. Some of it is quite obvious. O Domine on the left part of the top bar, IHS on the center pivot, and Chrisste on the right side of the bar. The curved bar says: Ave Maria Gracia Plena, Dominus tecum, Benedicta tu in melieribus et… but then they lose me in the abbreviations. For non-Latin scholars that last part is the beginning of the “Ave Maria” that was said as part of the rosary – Hail Mary, full of grace, the Lord is with thee; blessed art thou amongst women. According to the museum listing it also says St. Maria and St. Barbara somewhere on the purse frame, probably on the back of the main support bar. The origins of the purse says it was found near Binham priory. Binham was a Benedictine Priory that, like all of the Catholic Priories in England was suppressed in 1539 during the reign of Henry VIII. It makes me wonder if this piece belonged to the Prior (head of the Priory) when the suppression occurred. Several Abbots were actually executed and hung from the gates of their own monasteries, and the looting of the monasteries and churches was commonplace. Anyway, back to purse frames. The most common form of large intact purse frame that we find looks like this. Intact frames are moderately rare. Usually we find broken pieces of the curved bars, because they are more fragile than the rather beefy crossbar. I have added two red arrows to this picture because the picture has a very important construction clue. I might not have understood this clue if I didn’t own a broken piece of an actual purse bar frame. Next Time: What the Clues tell us and More about purse forms! This entry was posted in Dress Accessories, Leather Purse or Belt Pouch With Brass Frame, Metal Casting, Metal Working and tagged Medieval purses, Purse frames by Eirny. Bookmark the permalink.